I sure am. Not with others. I am incredibly competitive with myself. I will never win races, but that doesn’t bother me. I have never been the best. I wasn’t the best swimmer as a kid. I wasn’t the fastest runner in high school track. I wasn’t a start swimmer in high school. But none of this ever stopped me. I love competition. Lots of people hate races and meets and get super nervous. I get excited and thrive in those environments. It is time to see where I am at. Have I gotten faster? Have I gotten stronger? I started competitively swimmer at age 9. I have always felt natural in the water. My mom said I was like a fish as a kid. I was on what was probably the best club team in the state, but was not one of the top swimmers. The coaches expected a lot out of us and pushed us a lot. No idea how I had that in me at that age, but I did. Maybe it was this that helped create my competitive nature. I even got to swim at the state swim meet a few times, in a relay, not the A or B relay, maybe the D relay. I didn’t care. I was going to swim my little heart out and boy did I. Skip ahead a lot of years (there were some college years in Madison, I enjoyed them) when a friend talked my into my first triathlon the summer after my Junior year of college. Wow, had I forgotten how much fun it was to compete. I swam across that lake as fast as I could. My parents and my friend’s parents said not only did I beat most of my entire wave out of the water I passed most of the wave in front of me as well. I LOVED it, every moment. Now I did get passed by some people on the bike and lots of people on the run (this was years before I was a runner), but I had a blast. I knew I could do better and convinced my dad to do another tri with me later that summer. My competition bug was back! And I haven’t stopped since. More tris, a half marathon, a marathon, and now countless races. These days I realized I cannot get a PR every time I race, but I have to have some sort of goal. I always want to do better. I always expect a lot out of myself. Someone told me this wasn’t competitiveness because it was with myself. I disagree 100%. Just because I’m not competing to win doesn’t mean I’m not competing. I mean, come on, how many of us actually have a chance to win races?And unless they are smaller races, how many of us are going to win our age group? If you have ever seen me finish a race, you would know that I am competing. 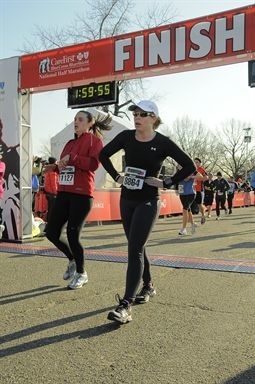 I have a finish line kick like no other. I have no idea where I pull it out of, I think it is all adrenaline, but I am leaving nothing out on the course (of course this may be why all my finish line photos look the same-see photo right). I want to knock off as many people as I can in the last tenth to quarter mile of a race. Is this isn’t competitiveness I don’t know what is. What about all of you? 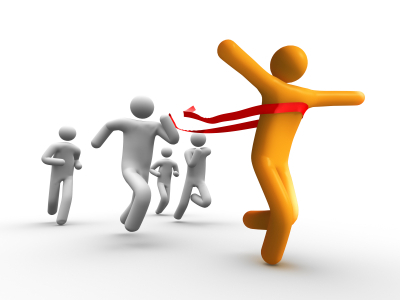 What does competition or competitiveness mean to you? Are you competitive? Not sure what I clicked on to find your blog, but I’m a competitive (super competitive!) runner and so I started at your first post and began reading. I think a competitive nature is just something you’re born with. I’ve tried to tone it down, but I can’t. I just want to set goals and accomplish them; for each season, each race, each week, each run. Sometimes it’s mileage, sometimes it pace, or speed, or age division, or overall in a race. It just depends on the race, the field, the weather etc. But regardless, there is always something to achieve. I love that feeling! Thanks. Sometimes I forget about past posts. It was fun to have this pop-up today. I definitely agree with you about being born with it. I still haven’t written my race report from last weekend because I am so upset about how it went. I am sure that writing it would help, but it won’t help me figure out what went wrong.